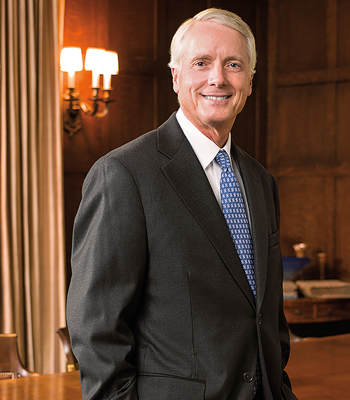 While it may have been founded more than a century ago, Northern Trust is hardly antiquated, says Frederick “Rick” Waddell, the bank’s chairman and CEO. The Chicago-based bank is a “124-year-old institution that operates in the 21st century,” he says. Waddell joined Northern Trust in 1975 as a 22-year-old transplant from Pittsburgh going to Kellogg part-time. He watched Northern Trust grow from a national bank to a global institution, handling asset servicing, asset management, wealth management and banking services for some of the wealthiest families, institutions and corporations on the planet. Likewise, Waddell’s career has grown from being a banking officer trainee to serving as CEO since 2008. He was named chairman in 2009. Since taking over, Waddell has repositioned the bank to make sure it resonates with the next generation of investors, adding mobile content and modernizing how transactions are handled. Waddell also has led an expansion outside of the United States, opening outposts in Germany, the Philippines and Saudi Arabia, and expanding in places such as Australia and China. “We like to be close to our clients,” says Waddell. All this outward growth has helped Northern Trust. As of this past June, Northern Trust had $5 trillion in assets under custody, up 9 percent from the prior year, and $803 billion in assets under management, up 14 percent from the same period. Net income in the first half of 2013 was $355 million, up 4 percent from the prior year. In all, Waddell has held 14 jobs over his 38 years at Northern Trust, a career that could have been short-lived. Early on, Waddell and his wife, Cate, thought about moving back to the East Coast. But then she started working at PricewaterhouseCoopers, his career took off and they started a family. “Once we put roots down, it just never occurred to us to leave,” Waddell says. As his stock grew, Waddell took leadership roles in areas like strategic planning and corporate and institutional services. He was already the bank’s president and chief operating officer when he was appointed CEO.